The 6.0 W12 from a Phaeton W12 makes 420 HP. The version from the A8 is dry sumped and makes 450 HP. It fits anywhere the 4.2 fits. I am using MS3+MS3x on my LS4 , megasquirt has made some huge leaps . I believe the MS3pro does as much if not more than most oem ecu's now. I am sure you will be quite happy and tuning is real easy . 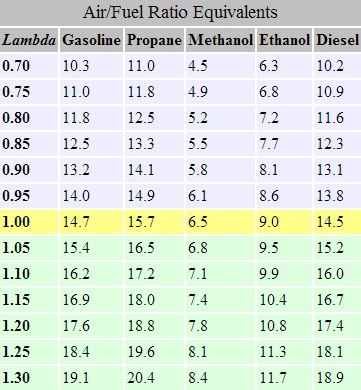 You need even more for ethanol... 14.7 is stoichiometric for 100% gas. I think he meant E10 Ethanol... IE, pump gas. I am not sure if I understand , if your cruising in a light load scenario you can run as lean as your engine allows. When you start to get lean miss fires that's too lean. At WOT and full load you want to run at least 13:1 I set my AFR table to 12.75 for a mild safety factor. Have you set up your AFR table ? If so then let "VE analyze now" do its thing and slowly work up to WOT runs. 14.7:1 is stoichiometric. It is *NOT* best for power. It is best for operating catlysts. If you don't need cats, forget 14.7. As mentioned above... at idle and light load, go as lean as you can without misfiring. You'll need to smoothly move the AFR down to between 12.5:1 and 13:1 at WOT. I assume you are looking for the wires that supply things like the fiero tach, speedo, brake switch, +12DC, grounds, fused engine circuits etc. While I'm no expert, there are two great pages in this 4.9 wiring thread by rockcrawl; http://www.fiero.nl/forum/Forum2/HTML/098096.html . You want the C500 fiero connector in the engine bay passenger side, and the C203 fiero connector under the ECM. Both are on the thread first page and will provide valuable info to integrate your megasquirt to the fiero wiring. I hope this helps...I have been looking forward to seeing this project run! If you got any progress pics, please post them. I'd love to see how things are going. Something like, yes, but not those. Those are for the ECM connectors. He'll need the C203 and C500 pinouts to wire up the engine bay harness to work with the MS3 and interface correctly with the Fiero body. Graft it all together at the MS unit. Pay careful attention to routing, as it's much easier to route the harness neatly now than it is to re-work it later.